Pastor Taeauga Ropati Frost delivers God's message of hope and encouragement to his Parish in Inala every Sunday morning in his weekly sermon, to prepare Gods people for His Work and Calling. Taeauga is the son of the late Lega Salaia Ropati Leaupepe Thomas Frost of Fasitoo-uta in Upolu, and Salelavalu in Savaii. His mother was Fugalaau Ropati (nee Lelevaga Taeauga) of Iva, Faasaleleaga, Savaii in Samoa. Taeauga worked in a field which was very different from doing God's work in his homeland of Samoa. He was working for the Criminal Investigation Branch (CIB) of the Department of Police and Prisons in Apia, Western Samoa. He left Samoa for New Zealand with his wife and two children in late 1973 because his daughter was very sickly in Samoa. He experienced a very different and difficult way of life during his early years in New Zealand, as would any new family who were trying to settle in a foreign country. But in December 1978 at a Church Camp at Hunua in Auckland, New Zealand he accepted Jesus as his Lord and Saviour. From then on, he was a very committed Christian who dedicated most of his life and time to do Gods work. During the following year, he was called to be a Church Minister in Petone, Wellington when the former Pastor resigned. He refused his calling because he felt that working for the Lord behind the scenes for his Church in Auckland was enough for him. But due to the encouragement and support of his elders in the Church, he felt compelled to accept the invitation to commit his life even more for the Lord. On the 30th December 1979 Taeauga was ordained as a Church Minister at a Church Camp at Upper Hutt in Wellington, and on the 5th of January 1980, he was installed as the new Pastor of the Petone Parish. 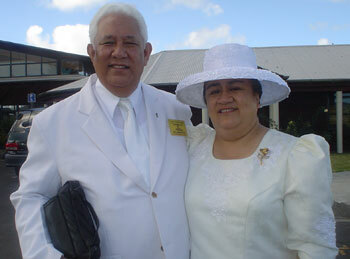 In 1981 he was elected as Secretary General for the Assembly of God Church of Samoa in New Zealand. This position extended to Samoa in early 1989 and to Australia towards the end of the same year. In August 1994, he was again called to be a Pastor in Brisbane, Australia when the last one resigned. A new Pastor was elected to take over the Church in Petone, and he moved to Brisbane with his family to be the Pastor there. Taeauga is very committed to his calling and he has a passion and energy to carry out the Lords Work. He is a highly respected Minister of the Gospel, who would not hesitate to help those in need and those who are less fortunate. He currently holds the post of Secretary General of the Assembly of God Church of Samoa in Australia Inc and he has also been a registered Religious Marriage Celebrant for the Government of the Commonwealth of Australia since the year 1995.